Need to get to that rendezvous in orbit with that Merchant Ship? Got to make a meeting on Ganymede Station and the Red Eye was overbooked? 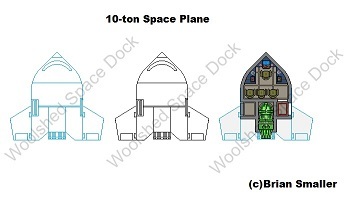 You need a personal 10-Dton Shuttle. Wings give that extra bit of stability in atmosphere and fold up for ease of storage in even the smallest space dock. A crew of one is required and it can carry up to three passengers and some luggage. The basic model illustrated has no bathroom so please make sure you go before lift-off. H/T: Forgot to include this and was reminded so by a reader. The shape of this shuttle comes from the FGU game Space Opera (Seldon’s Compenium of Starcraft I) to be exact. Very nice. Are you going to be making some side, front and rear views of your ships anytime soon? That would require from artistic skill – I could give it a go. Have been thinking of it for some future projects. If you can draw top views, then you have the skills. Now, the question is do you have the time and the gumption? A deck plan is one thing. Check out my Denoba-class and Banner class light merchants – I did some outside views of them but the colouring was very basic – just fills with greys and browns.